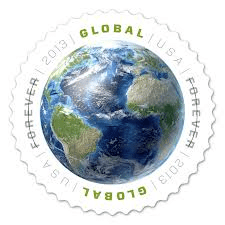 “Global Forever” sounds like a rock anthem. Actually, it’s one of the best parts of the upcoming postal increase Monday. For the first time, air mail will have some simplicity. It’s $1.10 per ROUND stamp. One of these beauties will get you up to a 2-ounce letter-sized mailing to Canada. You’ll still need Canadian postage on your SASE back to the USA, however. For the collectors outside the United States, there won’t be the worry of not getting a response before the next postal increase. Buy it now (or when it’s on sale Monday) and get the benefits FOREVER. Hence, the name. My only wish? The stamp is round. Make one that looks like a baseball!